Does the Bellmoor Inn and Spa offer catering? We offer full catering services through Big Fish Market featuring a broad menu. Meeting and event planners have the flexibility to choose their own selections based on personal preferences and dietary restrictions. Additionally, we offer discounted lunch specials through Big Fish, as well as beverage service and energy breaks to fuel meetings and events. Breakfast is included for all overnight guests. Is there an additional fee to use Wi-Fi or Audio-Visual Equipment? Wi-Fi and Audio-Visual Equipment are complimentary to utilize while renting any meeting space. The Delaware Room and The Sussex Room feature a built-in screen and projector. The Rosewood Executive Boardroom features a 60-inch flat screen TV mounted to the wall for presentations. We encourage the use of all our amenities! How much does it cost to rent the meeting spaces? We do not require a minimum rental time, and therefore we customize our rates to meet the needs of meeting and event planners. We will create a fair rate for the meeting space(s) reserved depending on the number of days and time frame the space is utilized. Can we rent the breakfast area/garden courtyard? These spaces are public areas for our guests to enjoy and cannot be rented. However, all guests, including meeting and event attendees, are welcome to relax and enjoy our serene common areas! Are we allowed to imbibe while on premise? 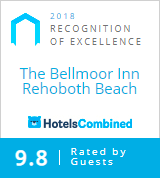 The Bellmoor Inn and Spa currently does not have a liquor license therefore our staff members cannot be responsible for purchasing, distributing, or serving alcohol. Our caterer, however, can operate under their liquor license to serve and distribute alcohol. Event attendees are also welcome to provide their own alcoholic beverages and maintain responsibility for their own distribution.